It's always fun to start a Mac vs PC flame war. But, while supporters of each platform can be a little tribal sometimes, the truth is that today's Macs and PCs have more in common than ever before. The roads they travel may differ, but the destinations look awfully similar: Intel-powered machines promising improved productivity and offering cloud storage and sync, personal virtual assistants and compatibility with mobile devices. Sierra doesn't come with any big design surprises: it looks almost identical to El Capitan, its predecessor. However, apps can now use tabbed windows like the Finder, and there's a new icon in the Dock and menu bar for Siri. More of her in a minute. The Windows 10 Anniversary Update, to our eyes, is Windows 8.1 done right: the Start Bar is back and much improved, and the confusing weirdness of Windows 8 is no more. It's a little gaudy for our taste, but the Live Tiles are useful, the Start Menu provides easy access to things you actually want to do and there's a big friendly box for invoking Cortana. More of her in a minute, too. Windows also has a built-in tablet mode for slates and 2-in-1 devices. Sierra doesn't, as Apple currently gives its mobile devices their own OS in the form of iOS. Touchscreen PCs also benefit from Windows Ink, which can translate on-screen scribbles into notes – albeit not as smoothly as you may have seen in the tech demos. Both Windows and Sierra offer automatic unlocking. Windows via approved smartphones or Windows Hello, which can identify you via special iris-detecting cameras or fingerprint sensors. Sierra does the same via your Apple Watch, if you have one. This macOS feature isn't available on older Macs, as they don't have the latest Bluetooth version. Macs also get Apple Pay in their Safari web browser provided they connect to an iPhone, iPad or Watch for Touch ID verification. Apple Pay is rolling out on the web now, as of this writing, albeit slowly. Windows 10 has attracted criticism for its license agreement, which says it'll disclose personal data, such as email and other private communications, via a "valid legal process" or if "someone is using our services to traffic in stolen intellectual or physical property of Microsoft." You can opt out of that by disabling some features or electing to run Windows without a Microsoft Account, although that does limit the availability and usefulness of Windows's cloud features and Cortana. 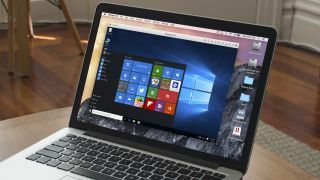 Apple's macOS and Microsoft's Windows 10 both enable you to use virtual desktops, but Microsoft has also added a four-window snap view that's particularly handy on large monitors. The not-entirely-loved Internet Explorer has been all but dumped in Windows in favor of Edge which, despite being a good browser, it's still playing catch-up. Safari benefits from a wider range of extensions, largely because Edge didn't support extensions at all until the Anniversary Update. Plus, Safari's ability to pinpoint and silence noisy web pages is a wonderful thing indeed – Edge can detect tabs making noise, but can't mute them. That said, both operating systems enable you to share functions between your computer and smartphone. For example, Windows 10 can send SMS messages from your PC. MacOS Sierra does more, though. In Sierra, you can make and receive calls, and the Universal Clipboard allows you to copy and paste files and text between your Mac(s) and iOS device(s). Apple's Handoff, which enables you to pick up on the Mac from the app you were using on iOS, is very clever, too. One of Sierra's headline features is that it puts your desktop in the cloud, wherein your Mac automatically syncs files and folders on your Desktop and Documents folders automatically, so they're available anywhere. So far, it's been a bit of a disaster. The way it works is confusing, and people with multiple Macs have been encountering all kinds of issues. That's a shame, because it's a great idea and iCloud syncing of other things – passwords, logins, contacts, photos etc – works well. It's a shame that it costs so much, too: Apple persists with its policy of offering free iCloud storage per account, not per device. So, if you have eight Macs, three iPhones, four iPads and an Apple Watch on the same iCloud account, you still only get 5GB of space for free. After that, it's $0.99 (or £0.79) per month for 50GB, $2.99 (or £2.49) a month for 200GB and $9.99 (or £6.99) for 1TB. Not that Microsoft's OneDrive is any better on value. It offers 5GB for free, too, and it's $1.99 (or £1.99) per month for 50GB. Terabyte storage is only available as part of an Office 365 subscription. By comparison, Google Drive's free tier is 15GB and Amazon offers unlimited cloud storage for $59.99 per year (or around £40). Mac gaming is much better than it used to be. In addition to more games being ported to the Mac than ever, any modern Mac is capable of running Windows games in Boot Camp. Plus, Apple's Metal API is making developers' lives easier. But, Windows remains the superior platform here, with much more choice in both hardware and in available games. Windows 10 brought in a new version of the DirectX API for both PCs and the Xbox One, DirectX 12, and Microsoft says that game developers have embraced it more quickly than they did any previous version. Windows and Xbox are becoming increasingly integrated, too, with universal apps, cross-platform play and cross-platform chat. Where Apple seems a bit puzzled by games, Microsoft takes the gaming community very seriously indeed. Both systems offer personal digital assistants: Cortana in Windows and Siri in macOS. Cortana accepts both vocal and typed queries, while Siri is voice-only. Siri is a new addition to macOS, as previously it was only available on iOS, but it's as good and as occasionally infuriating as its iOS sibling. Plus, Siri on macOS has for more access to the underlying OS's files, folders and apps than it does on iOS. Cortana's very good, but Windows doesn't enable you to drag Cortana results into the document you're working on – something that's already proving to be a winning feature for Siri on macOS, too. That said, access to Cortana is more present throughout Windows 10 than Siri is throughout macOS, complete with voice activation, which Siri does not on macOS. For a detailed breakdown of how the two compare, check out our thorough Siri vs Cortana piece. As ever, macOS Sierra only works (officially) on Macs: specifically 2010 Macs and later, although some 2009 models are covered, too. Of course, that allows macOS to be tailored specifically to its range of Mac devices, making way for features like Handoff, the cloud clipboard and more. Meanwhile, Windows 10 will run on pretty much anything. The minimum system requirements are identical to Windows 8.1, so that's a 1GHz processor, 2GB of RAM (for 64-bit), 20GB of hard disk space and an 800 x 600 display. It won't run brilliantly on that spec, but it'll run. The point here is versatility. Windows 10 was available free to users of Windows 7 and 8 for a whole year, but the free period ended in July. If you haven't already upgraded to or bought a machine running Windows 10 then it's $119.99 (or £99.99) for Windows 10 Home and $199 (or £189.99) for Windows 10 Pro. Apple, like many times before, has made macOS Sierra is a free upgrade for compatible devices. The winner depends on who you are, honestly. Are you constantly moving between iPhone, iPad, Watch and Mac? Is your Mac of relatively recent vintage? Then macOS Sierra was made for you: nobody does the gadget family thing quite like Apple, and Sierra's mobile support and user-friendliness are first class. We're not sure we'd trust iCloud with our Desktop just yet, but its irregularities will be solved soon enough. If you're a gamer or a power user, or just someone who just doesn't think Apple's OS justifies the cost of its hardware, then Windows 10 Anniversary Edition was made for you. It's genuinely the best Windows yet, and what it lacks in beauty and simplicity it more than makes up for in customization and flexibility. It's just a shame that the free upgrade period has ended. This article has been updated for TechRadar's Mac Week. This year marks not only the 10th anniversary of Apple's MacBook, but the triumphant return of macOS. So, TechRadar looks to celebrate with a week's worth of original features delving back into the Mac's past, predicting the Mac's future and exploring the Mac as it is today.